BUN-CHING LAM, born in the Macao region of China, began studying piano at the age of seven and gave her first public solo recital at fifteen. In 1976, she received a B.A. degree in piano performance from the Chinese University of Hong Kong. She then accepted a scholarship from the University of California at San Diego, where she studied composition with Bernard Rands, Robert Erickson, Roger Reynolds, Pauline Oliveros, and earned a Ph.D. in 1981. She taught at the Cornish College of the Arts in Seattle from 1981 to 1986. 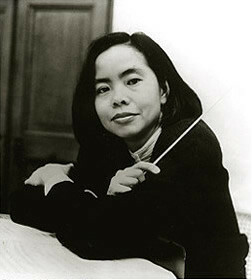 Recently appointed to serve as the resident composer of the Macao Orchestra, Ms. Lam was also a composer in residence at the America Dance Festival and the New Jersey Symphony Orchestra for the 2000-2001 season. She has been honored by fellowships from the Guggenheim Foundation and the American Academy of Arts and Letters. She also won the Rome Prize and was awarded first prizes at the Aspen Music Festival, the Northwest Composer’s Symposium, and the highest honor at the Shanghai Music Competition, which was the first international composers ’ contest to take place in China.